Monsoon could be an irritating time for gardeners, with wild vegetables (or weeds) taking over flower beds and sidewalks. But before you pick up a hoe or chemicals to get rid of the pesky lot, here’s food for thought: the wild vegetables could be tastier and more nutritious than the vegetables in the market. 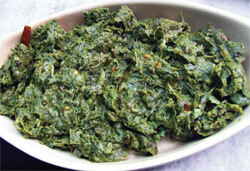 For the tribals of central India, these wild greens offer a break from the everyday dal-roti and vegetables. While a few wild vegetables are recognised for health benefits, most are eaten for the taste and variety among the tribals. Tests conducted by non-profit Dharamitra in Maharashtra’s Wardha district attribute high nutritional content to most of these vegetables (see ‘Nutritional content of bhajis’). In central India, green vegetables are called bhajis. One of the most common uncultivated greens that appears during the monsoon is Cassia tora, known as tarota bhaji in Maharashtra and charota in Madhya Pradesh and Chhattisgarh. It is regarded highly by tribals for being effective against asthma and pains brought on by monsoon chills. All parts of tarota bhaji can be eaten; tender leaves are stir fried with onion, garlic and red chillies, while the flowers are fried and eaten as a medicine for asthma. The tender beans and soft seeds of the bhaji are cooked in stir-fried preparations; mature seeds are ground and made into vadas or ground with wheat or sorghum (jowar) for making chapattis. The tribal people warn that since tarota bhaji is warm, it should be consumed in small quantities at a time—too much in one go could cause diarrhoea. Some more examples of wild vegetables popular among the tribals are kena (Commelina benghalensis) and aghada (Achyranthes aspera) bhajis—often mentioned together due to their religious significance as seasonal offerings to gods. They are most likely to be found growing close to a wall or along roadsides, and are often cooked together as a stir fry with a sprinkle of sorghum flour. Kena, a soft herb, can be consumed wholly, though, for the sake of conservation it is customary to pluck only its top. The leaves of aghada taste like fenugreek leaves, but their season is short—about 20 days in July—after which they turn bitter. Khaparkhuti (Boerhaavia diffusa) is a soft, succulent creeper that tastes like spinach. One should be careful while plucking, since khaparkhuti grows in company of several inedible varieties that mimic its looks. If there is a large puddle or a waterlogged empty plot in your locality, you are likely to find several varieties of bindweed creepers trailing along the water surface. A trained eye can easily find the delicious kamroon bhaji (Ipomoea aquatica) in the puddles, but again, beware of look-alikes. This bhaji cooks to a delicious, moist preparation when stir-fried and steamed with a handful of soaked moong dal (skinned green gram). Kamroon is good for pregnant and lactating women because of its high iron content and easy digestibility. One can also find abundant quantities of tinpani bhaji (common clover variety belonging to family Trifolium) near the puddles. A handful of this bhaji, which tastes sour, in any dal will result in a refreshing, delicious preparation. Tinpani is said to build immunity against cold-related infections. Another weed that can be found near a waterbody is kukurda bhaji (Celosia argentea). 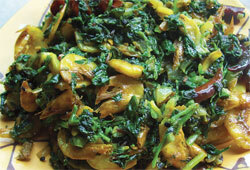 Its soft green tops are cooked with a handful of Indian sorrel leaves to make a tangy preparation. “Most of these bhajis are prepared in a similar manner with slight variations,” says Manorama Lilhare, who hails from Chhattisgarh and works as a domestic help in Nagpur. She helped this Down To Earth reporter in identifying and cooking the greens. “The trick is to identify the right bhaji, pluck only the tender leaves and tops, and clean them to rid them of bugs and dirt,” she says. Before you run out of the house to look for these greens, a word of caution: while doctors recommend cooking vegetables in iron utensils to enhance iron content, tribal wisdom warns against it. Ayurvedic practitioner Vrunda Kate in Nagpur, who has researched tribal food-medicine practices, says, “In most tribal areas, cutting leafy vegetables with iron knives or cooking them in iron pots is avoided, since the extra iron released from the contact makes the green indigestible.” A better alternative is to consume these vegetables, including the wild ones, more frequently to get maximum natural iron, Kate suggests. Dear sir/madam Your article seems very informative and scientific. Media reports show farmers injecting all commercial vegetables like brinjal,cabbage,cauliflower,capsicum with chemicals to make them bigger and grow faster. Your article may motivate and enlighten others to grow these vegetables commercially. Whatever the crops you mentions here are medicinal plants but you call them weeds? How?! Excellent article. I respect CSE and Down to Earth for focussing on age old scientific practices. Traditional Water Harvesting methods is one. We must adopt what has been the best in the past and orient itself to the present day needs with modern tools. Nice information regarding few of the tropical wild eatables. Please work on the traditional knowledge of temperate areas also, especially Himachal Pradesh. A very informative article but I think the scientific names need to be italicized as per the convention.